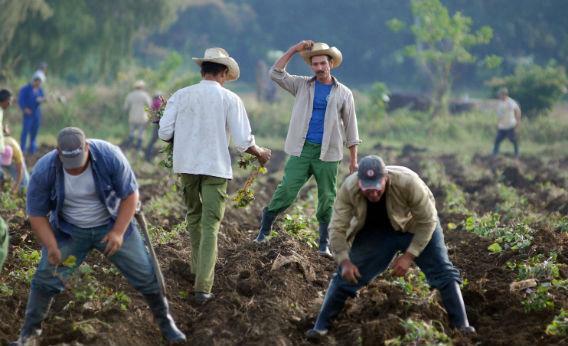 Cuban farmers planting sweet potato crop. “Matildas midfielder Hayley Raso says the pay increase gained by Australia's top female soccer players could not have been obtained without strike action,” the Sydney Morning Herald said on November 9. In the first ever strike by a national sporting team, the Matildas refused to travel to play world women's football champions, the US, in protest at the refusal of Football Federation Australia to meet their demands. When veteran left-wing activist and MP Jeremy Corbyn entered the race for British Labour Party leader, sparked by former leader Ed Miliban's resignation in May, he did so reluctantly on grounds it was “his turn” to be the “token socialist”. But in a stark sign of the depths of anger at brutal anti-poor austerity and disillusionment with mainstream politics, Corbyn was declared the overwhelming victor on September 12 with almost 60% of the vote – more than a quarter of a million votes in total. His nearest opponent got 19%. Greece's austerity-and-debt-driven crisis has prompted a humanitarian catastrophe. The Australia-Greece Solidarity Campaign says half of all young people cannot find work, there is a growing shortage of essential medicines and child malnutrition rates have reached levels not seen since World War II.